The magician takes out three color balls. He announces that he will demonstrate his extraordinary talent. He then bounces the balls off the table one by one and catches them in the opposite hand. When the audience laughs at this, he says that it has taken him years of practice to master catching all three, and he offers a prize to anyone who can do it. A spectator comes forward to try. The magician hands the balls over. But when the spectator tries to catch them all himself, he just cant do it. And so he never gets the prize. ・When the spectator is trying to bounce the balls, the magicians hands are empty, making the effect more convincing. ・The three balls allow for a smoother, more convincing performance. ・These balls are specially made in Japan. 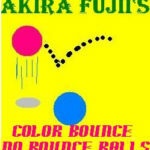 ・Because these balls are brightly colored, the No Bounce ball and the Bounce Ball of the same color are far less distinguishable than the other version that used only black. ・The three colors of the balls you receive may vary.